Not often do you get to try a new content update three times before it is actually released to the game. The Mining & Smithing rework however, is such a rare occasion where that is possible. I think most people will be familiar with the rework by now, but let me give a quick summary anyway: the Mining and Smithing skills currently suffer from several problems. Mining and Smithing requirements are completely out of line with the requirements to wear and use its results. This does not only cause a big disparity (especially for ironman accounts), but it has also caused a low value of what are in fact high level skilling products. The rework solves these problems, among others. It pushes each metal down to its respective level in line with combat, and introduces new tiers to fill the top end. In addition, it also rethinks the skilling mechanics entirely. Most importantly, Smithing is completely reworked. No longer will you be smelting inventory after inventory of gear, but you'll work your items for longer using new heat mechanics. Together with removing actual gear drops from monsters, the supply of new items onto the market will drop significantly, and economics tells us this will make prices of armour and weapons rise. Once more, skilling can be profitable again, and even feed the high-end PvM community. It is amazing to see how well the new mechanics address the problems. Not only that, but I believe both Mining and Smithing have become more engaging, more well-rounded skills in the progress. I could spend the entire article talking about this, but instead I want to discuss something specific: polish. Whenever you play a beta, you expect plenty of rough edges to be present. Let's be honest, we are pretty much expecting rough edges to be present in any update Jagex releases these days. It therefore surprised me to see how complete the beta already feels. Not only are the game mechanics rock solid (pun intended), you can't tell that the skills are actually brand new additions to the game. One example of this is how well the skill unlocks are spaced out. People like Smithing because it unlocks something every level. After the rework, you unlock all Smithing items within a tier at the same time. This is really cool, because it means you can be completely self-sufficient (which is especially cool for untradeable items such as the ore box), but it also leaves the levels between tiers empty. Luckily the levels are filled with small improvements that make you better at Mining or Smithing respectively. Something cool to look forward to every level. It makes progress in the skill feel awesome: you always have something small (the next level) and something big (the next tier) to work on. Another example is the sound and graphics design. Your first swing at a rock will have green sparks. As your stamina decreases, the sounds change. A similar mechanic is more obvious when working on a Smithing process. The sparks turn from white to orange to red as the metal cools down, and you will hear the sounds changing as well. Does this level of detail matter much? Maybe not really, but it adds an extra layer of "ohhh" when you first realise it. It shows that there is depth beyond the skill mechanics. For every detail you do notice, there will be details you don't notice. Not consciously, at least. The power of polish is just that: you may not know the details of what is going on, but everything just feels... right. That is the feeling that came over me when I did a Smithing project: it felt right. Does that mean the rework is ready to be released? Why wait for 2019 if everything feels so right? No, the update isn't ready quite yet. See, polish can also work the other way: it can completely pull you out of your immersion. One thing that I kept struggling with during the beta is the UI. In a polished product, the UI is not something you have to fight with to get done what you want to get done. Multiple times I would be stuck looking for a specific in the UI. In the livestream where I play-tested the Mining & Smithing rework, I travelled to Kethsi to figure out how to smelt my dragonbane ore, just because I didn't see it in the UI. Let's be honest, UI polish isn't really one of RuneScape's strengths, and the Mining & Smithing rework is no exception. It would behoove Jagex to spend some extra time on the Mining & Smithing UI. Taking the time to take away this last bit of friction would really make this update something that goes beyond the average update quality. The level of polish in Mining & Smithing shows the strength of numbers. By releasing all the design documents, Jagex had an entire community to find the little gaps and give suggestions about how to fill them up. Over years, all these small fixes have added up and come together. This tells us that the polish we see here is unlikely to be matched in future updates. RuneScape's update cadence just doesn't allow repeated iterations and long discussions around shared design documents. This is where Ninja fixes come in, adding polishing layers after updates have already been released to the wider public. Still, it is important for Jagex to get it right. When the Mining & Smithing rework comes out, it will have to contain eighteen years worth of content, lessons, and details. The last time we saw a big change like this was the release of the Evolution of Combat, and we have seen what happens when you don't get your polish right. 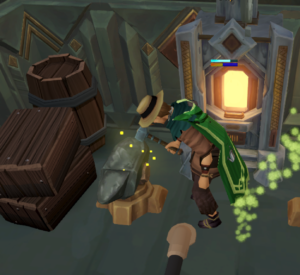 Luckily, Mining & Smithing seems to be on the right track, and with yet another month to get rid of all the last hitches, it will surely be a pivotal moment in RuneScape's history of skilling.